Lock and Load! 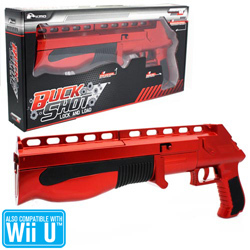 The BuckShot contains an integrated controller placed directly into the handle that provide similar functions of a wired Nunchuck. It also hosts a pump-slide reload feature in order to access the A button, while the trigger accesses the B button, giving you the feel that you're actually blasting away at the bad guys! The rubber grips ensure an easy hold and a fast reload time, making it ideal for games such as Call of Duty 3, Call of Duty: World at War, Links Crossbow Training, House of Dead 2 & 3 Return, House of the Dead: Overkill, Resident Evil: Umbrella Chronicles, James Bond: Quantum of Solace, and other first person shooting games for Wii!